These festive Christmas ecards for business are the perfect design for you to say ‘Merry Christmas’. 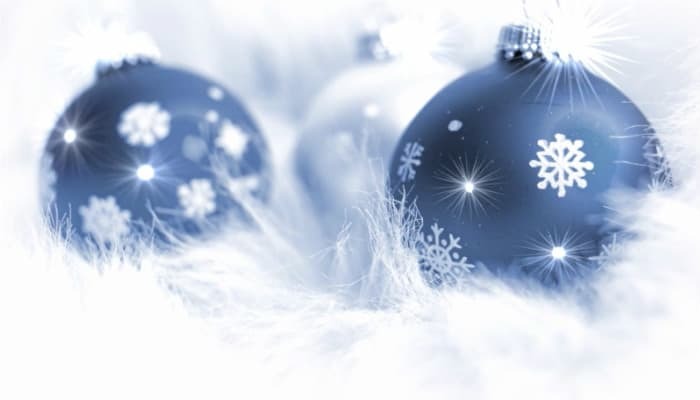 The blue and white baubles will instantly make the receiver think of snow and ice so it’s the perfect choice for anyone who lives in a place where there’s a lack of snow for Christmas. We always associate snow with Christmas and most of us always have that ‘white Christmas’ wish so these colour choices are ideal for anyone that enjoys waking up to snowfall on Christmas morning. The ecards image will remind you of icicles and cold mornings; the ones we all happily endure because it means Christmas is around the corner. If anything, these corporate ecards will help add to the excitement and you can personalise your preferences according to what you think the receiver would like. Getting an ecards has become much more practical and favoured above regular post, so surprise someone with a great treat this winter. You’re guaranteed to put a smile on someone’s face with this design and they make great email Christmas cards for business. Have a browse through some of our other designs and do your seasonal cards the easy way.